A sweet looking pink and white colored theme that focuses mainly on the theme of love! 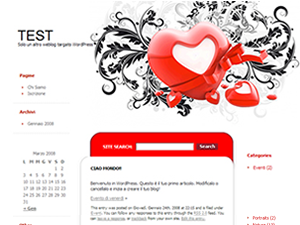 The theme has a beautiful looking header with the symbol of love, the heart. It is a fixed width two columned theme with a content area and a sidebar. The theme has a white background on which the content area of the theme is displayed. The theme has a distinct sidebar which allows you to remain connected to the various categories of the website. The edges of the sidebar and header are rounded. The theme has a traditional navigation bar that briefs you about the website. A fantastic and extremely attractive brown black theme with all the basic structures! The theme has an elegant looking brown pattern as its base with a distinct header and content area. 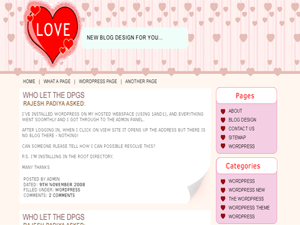 The theme has a blue colored large header which focuses on the symbol of love, the heart. It also has the traditional navigational bar which links you to the other categories hosted by the website. The theme is a two columned fixed width theme which hosts a content area for the display of the regularly updated posts, while the sidebar has the links to the other pages. The sidebar categories are displayed in bright green color. The edges of the header, the content area and the sidebar are rounded. A charismatic looking wordpress theme with a white backdrop! The theme has a distinct and attractive header featuring a distinct search area. The header is very realistic and also features a traditional looking orange colored navigational bar that helps you to link the various categories of the website. The content area of the theme is two columned with a fixed width. The content area displays the regularly updated posts and the comments along with images while the sidebar is distinct and features the various links to the other pages. The side bar, navigational bar and the header have the rounded edges. 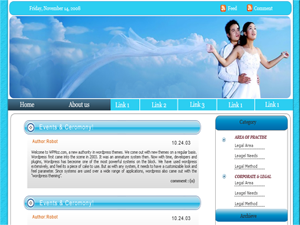 A charismatic love based wordpress theme most suitable for your wedding related websites. 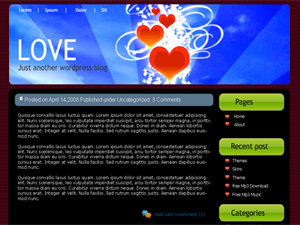 It is an avatar ready theme with a fancy header revealing the essence of love. The theme has a big and romantic header that stresses more on love. This is a two columned, fixed width theme. The wordpress theme has round edged content area and navigation bar. The navigation bar offers distinct navigation for the various pages. . The wordpress theme has a splendid blend of various shades of grey with the contrasting color scheme of blue and green. The color of the wordpress theme can be modified based on the constraints.